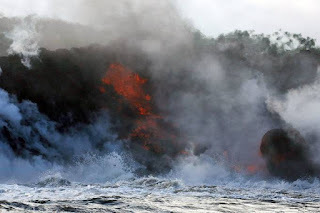 Pahoa, Hawaii-the Hawaii went on to deal with a new danger as a result of the eruption of Kilauea volcano, as lava flows can produce clouds of acid gases, steam and glass-like particles on reaching the ocean Pacific, alerted authorities. The civil defense warned motorists, boaters and swimmers to be careful with the caustic columns of lava formed by two streams which advance to the sea since crossing the highway 137 in the southern coast of the largest island of Hawaii on Saturday night and on the morning of Sunday. The "laze" – a term which combines the English words for lava and mist-is a mixture of gaseous hydrochloric acid, steam and volcanic particles lowercase created by the eruption of lava that can reach 1,093 degrees Celsius and reacts with seawater, said the Hawaii County Civil Defense in a statement. The bulletins also warned that reports of toxic gas derived from sulfur dioxide erupting from various points around the volcano have tripled, urging residents to "adopt the necessary actions to limit exposure. Be aware of the danger of ' laze ' and keep away from any column of smoke from the ocean", recommended the Agency, warning that the potential risks include lung damage and irritation of the eyes and skin. With Sunday's weather conditions, which had strong winds and a large amount of lava if pouring into the ocean, the columns of laze can extend for up to 24 kilometers, mostly along the coast and on the high seas, but the danger decreases the more they dissipate Sea, according to Janet Babb, a geologist of the Geological Center of the United States (USGS).